Style your home desk with the executive styled LOF-509-O office chair from CorLiving. Featuring an extra thick leatherette covered seat with contoured foam filled back support, tilting backrest, gas lift, black and silver arms and legs with rolling wheels. The comfortable, contemporary design will accent any large desk setting while offering the option to adjust to your body height and shape with ease. A great addition to any home! 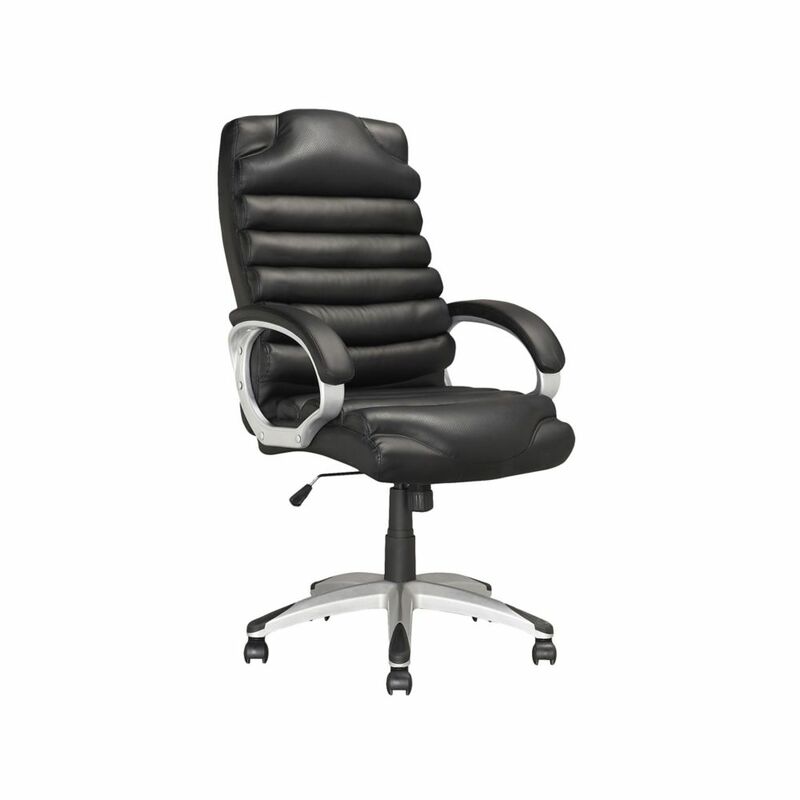 Sit in ergonomic comfort with this black office chair and easily adjust the height of the chair to suit your desk. The high back is curved at the base to offer lumbar support and the headrest adjusts to keep everything in alignment. The pedestal features four legs for stability, each attached to rolling castors to facilitate easy and quick movement. Covered in a high-grade mesh material, this office chair comes in a black colour to complement any office dicor. Keep your body aligned and supported in a chair that looks professional and boasts ultra-comfortable seating. Get away from the traditional and upgrade to this stylish office chair. You'll love its ergonomic design and comfortable seating, while the contemporary stylish and just the right amount modernism to your home or office. Featuring a gas lift and tilt mechanism for optimum comfort based on your individual needs. LOF-509-O Executive Office Chair in Black Leatherette Style your home desk with the executive styled LOF-509-O office chair from CorLiving. Featuring an extra thick leatherette covered seat with contoured foam filled back support, tilting backrest, gas lift, black and silver arms and legs with rolling wheels. The comfortable, contemporary design will accent any large desk setting while offering the option to adjust to your body height and shape with ease. A great addition to any home!